Hey everyone! How are you? Are you guys excited about the new year?! I'm still taking a break from nail blogging (and enjoying all the extra time, to be honest! ), but I wanted to pop in and share my favorite polishes from 2015, because it didn't seem right not to! If you're thinking that there are more than 15 polishes in the cover photo, you're right! That's actually my initial finalist pool. 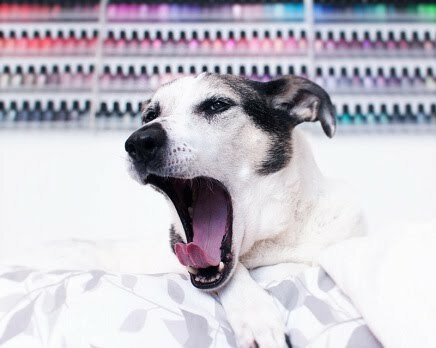 I only had the opportunity to use Rayne in a couple of nail art looks, but I feel like it stole the show in both! It's just the prettiest blue with icy blue-green glassfleck shimmer. So love! Fireball is actually brighter than my pictures manage to show but it's just stunning and flattering on. I've worn it on my toes and fingers, and love it on both. Had an amazing formula too! It's seriously one Orly everyone needs...even if you think you don't like reds! Whirlpool caught me by surprise! It's part of the Formula X Seaglass collection, which was just full of win for me. It's actually my favorite matte/ textured finish set of polishes released this year. They really nailed the sparkle factor without sacrificing the polish's texture- no lumpy grit blobs here! And oh yeah, that soft taupey purple color is right up my alley! Here's another soft taupey purple for you! Coat Couture was the clear standout for most people from Essie's Cashmere Matte collection. It had a great, easy formula too- unlike some others from the set! Look at the shimmer! I love Divine Disease because it's a grungy, moody color, but it has beautiful flake and shimmer in it which bring it to life. It's my favorite from ALIQUID's Fall 2015 Incarnate collection! Just perfect! Ah yes, one that won't surprise you. This is possibly the most hyped and coveted Femme Fatale shade this year! And, I have to say that Mirror, Mirror, On The Wall lives up to expectations with beautiful holo, iridescent hex glitter and crazy dense pink-purple shimmer swimming in an aqua base. Amazing! This is probably my favorite Femme Fatale release though, possibly because I almost missed it! Hundred Year's Winter hits that neutral-with-a-twist spot so well, and I keep finding myself wanting to wear it for its intense shimmer. It was difficult to choose a favorite from Indigo Bananas' Neon, the 10th Element collection of neon cremes. In a year of neons, that collection was the best that I tried, hands down. All of the 10th Element neon shades are excellent, but I think Sulfur Green has to be my favorite! It's radioactively bright, and I do love crazy neon greens! Here's another neon creme that won me over! Miami-Dade is just the prettiest shade of green-tinged blue, and I love how my hands look when wearing it! This year, I really grew to love thermal polishes, and Swimming With Mermaids is my favorite from the 2015 releases I tried! It's super sensitive, and shows the thermal change even on shorter nails. Very, very unique, and the holo sparkle doesn't hurt either! Here's another KPT shade that I adore! Selene is from the Fall 2015 After 7 collection and is probably the most unique holographic polish I own! It has this reddish magenta shimmer that can even make the polish look coppery at the right angle. Excellent formula too! This year, ILNP released some of my favorite polishes the brand has ever put out before, so I have three in my top 15! How can you not love the saturated blue-teal holo jelly that is Harbor Island?? I need to wear it again, stat! Long Walks will probably not come as a shock either! This was the most talked-about polish ffrom this year's Summer collection- and for good reason! It's got a flattering, wearable taupe base color filled with holo shimmer and amazing dense, gold shimmer. And, oh yeah, the gold flake! It's interesting and lovely no matter the lighting condition! Finally, Juliette will surprise no one! This is the most adored ILNP polish from the Winter Collection, and definitely my favorite of the Precious Metals finishes. In fact, I'm wearing it as I type this...for the third time! I actually wore it alone as my Christmas mani, and it was perfect. (And, it drew several compliments, actually!) Classic, perfect two coat formula, rose-gold shade you need to own! That's it! As you can tell, I am a bit biased toward some of the brands I swatch for, and it's partly because I'm able to try, proportionally, more of those brands' polishes, and partly because, well, in my opinion, they are glorious nail polishes! What can I say? What do you think of my top picks for 2015? I'd love to know what your favorite shades were this year! Can you narrow it down to a single polish? ?